Most of us have been seduced by the romantic notion that travel writing is all about creating writing skills. 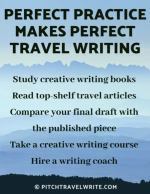 I'm here to tell you that there are travel writing secrets to success that have nothing to do with writing skills. Granted, writing is the fun part. But staying focused on writing paints a lopsided picture that has little to do with success. Many gifted writers seldom see their work in print, while other writers with lesser talent—but good marketing skills— manage to shoehorn their stories into practically any magazine they choose. It may not be fair, but that’s the way it is. The simple and jarring fact is that you need to know how to sell your travel stories. Of all the travel writing secrets, this one is most critical. If you can’t sell your travel stories you’ll never get the chance to write them. Freelance writers who “just want to write” and can’t be bothered learning and refining their marketing skills are doomed to failure in the hyped up market today. I don’t know of any successful travel writer without some form of marketing strategy and platform. Think for a moment about a couple of today’s most successful travel writers, like Rick Steves and Bill Bryson. Although they are vastly different in their approaches, they both have very sophisticated marketing skills and have established formidable sales and promotions platforms. They sell their stories, books, DVDs, and even international tour packages and a slew of travel merchandise. They really get “It”—“It” being that their enterprises wouldn’t get off the ground without effective sales and marketing strategies. Most of us don’t aspire to be as famous and successful as these guys. But we can learn a lot of travel writing secrets from these experts. 1. Get on the bandwagon. 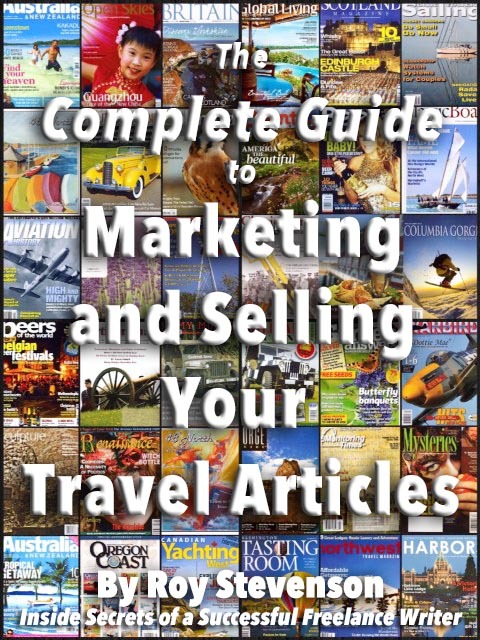 Study and implement the art of marketing yourself and your freelance travel articles. In other words, learn how to build your own marketing platform. 2. Wither on the vine and walk away from a tremendously rewarding career that offers virtually unlimited free or low-cost travel opportunities. Not to mention a creative outlet for your travel writing. For a writer to succeed in today’s market, you need to be comfortable selling your brand and your products to at least two groups of people: magazine editors and tourist destination media reps.
• Conjuring up enticing travel stories that editors cannot afford to pass up. Or, if you have a blog, doing the same for your audience. • Creating thorough magazine distribution lists to pitch your stories. • Sending out tantalizing query letters, and letters of introduction, to editors and tourism media reps.
• Networking with editors and destination media reps at conferences, tourism promotion events, and via social media. • Maintaining a powerful website and/or a credible and attractive blog. • Maintaining an active social media presence. There's a lot to do, and many freelancers are overwhelmed about doing these things. Where do you start? Every week I receive questions from aspiring writers who want to know the secret to my success. The answer: I work a lot on sales and marketing, including self-promotion. You’d be surprised at how much time I spend on sales and marketing and building my writer’s platform. In my first few years of writing, most of my time was spent querying stories to magazine editors. Querying stories is also marketing - it’s a well-thought out sales pitch. Now that I work with a regular group of editors and don’t need to write as many query letters, I still do something every day to promote my name and brand and sell my stories and eBooks. To decide on my strategies, I keep in mind my main goals: writing for print publications, traveling on press trips, and building an active website and audience. • Announcing something new or newsy on social media and Facebook. • Posting an article or product advertisement on my website or someone else’s website. • Sharing a guest post. • Reaching out to a magazine editor with a new story idea. • Attending a writer’s conference and buttonholing magazine editors with story ideas. • Attending travel shows and working the tourist destination and tourist attraction reps, and hotel & resort sales and media reps, for assistance with travel and accommodation. 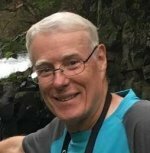 • Writing an e-zine to connect with my readers. • Sitting down, speed-dating style, across from national and regional tourism agency media reps and showing them how I could produce multiple juicy stories about their country or region—if they’ll just send me there for a week or two! To be successful as a writer you must create a relentless and multi-faceted marketing juggernaut geared toward your goals. Try thinking of the tasks to be done like a jigsaw puzzle. If you fill in a small piece every day by doing one or two simple tasks, you’ll soon build up a respectable platform. Here’s another news flash: successful freelance travel writers are not modest people, no matter how “Aw shucks, it’s nothing” they might appear. They can’t afford to be. Beneath their battered Tilley hats or crumpled khaki clad façades, they’re very cunning and calculating. Successful writers are always trying to figure out how to match up one or two of their magazine or online outlets with the attractions at an exotic destination, to score a sweet press trip. Or they’re trying to mesmerize the crowd at a conference enough to purchase their latest book, guidebook, eBook, workshop, or DVD. Remember, it’s a business. You are selling yourself, your stories and/or your products all the time. Nothing will happen if you don’t make it happen. Put yourself out there and play the part. Aspiring writers are often led to believe that writing a resounding query letter is all it takes to snag those magazine assignments. Although creating a breathtaking query letter is an important part of your marketing strategy, it’s definitely not the only marketing tool in your toolbox. In an era when some travel writers and bloggers are achieving the status of minor rock stars, we have to use every appropriate marketing technique possible to stand out above the horde of other writers and to sell our stories. Do I recommend that every writer adopt the same marketing strategy and use identical sales and marketing modes? Today, with so much technology at our fingertips, we have a huge marketing toolbox with a wide choice of sales tools available—with new apps emerging continuously. 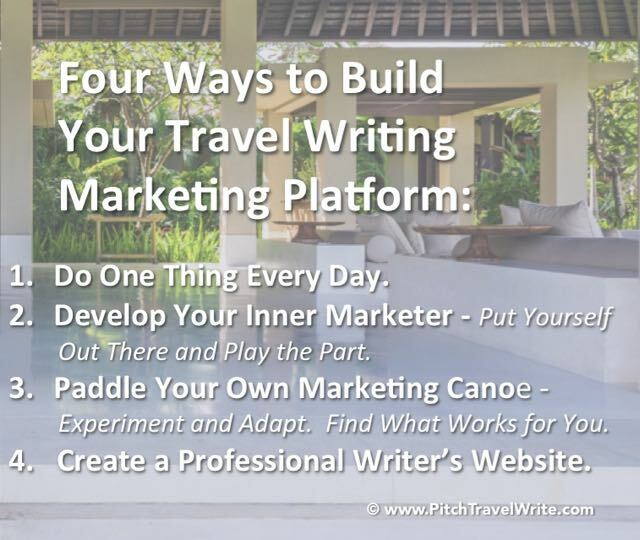 You need to figure out which sales and marketing techniques work best for your travel writing niche, then develop and sculpt them into a finely honed marketing machine. Not all sales tools or social platforms will be effective for you. Be prepared to try some of them, and then drop the ones that don’t work. Keep experimenting with other new techniques as you learn about them. As recently as two years ago, I had completely written off Facebook as a method of securing travel assignments from magazine editors. I decided Facebook was a waste of time. And today—based on my experience—Facebook still remains a highly ineffective way of getting assignments from editors. But somewhere along the way, before I cancelled my Facebook account, my market changed. 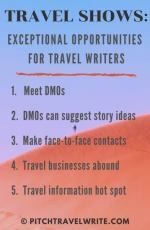 In addition to pitching stories to editors, I started building an audience of travel writers for my website, PitchTravelWrite.com. So, as your travel writing markets change, your preferred modes of social media may change, too. As you evolve, be prepared to experiment and adapt. There are few travel writing secrets, but my professional writer’s website (www.Roy-Stevenson.com) has been a big one. It helped enhance my credibility in magazine editor’s eyes. It has been a major factor to help magazine editors decide to accept my pitches and give me assignments. My writer’s website has certainly helped dozens of destination media PR reps decide to back me for press trips and Fam tours to their territory. I’ve written about this in previous articles, but if you do nothing else, establish a writer’s website to enhance your credibility. I’m still amazed at how few travel writers have this basic marketing box checked, so I can only encourage you to create a professional website. Once you get it up and running, it’s very little work to maintain. And it’s well worth the investment. Today’s travel writer cannot afford to neglect marketing and sales. It’s one of your foundations for success. Work at developing your marketing skills, find what works for you, and exploit it to the max. 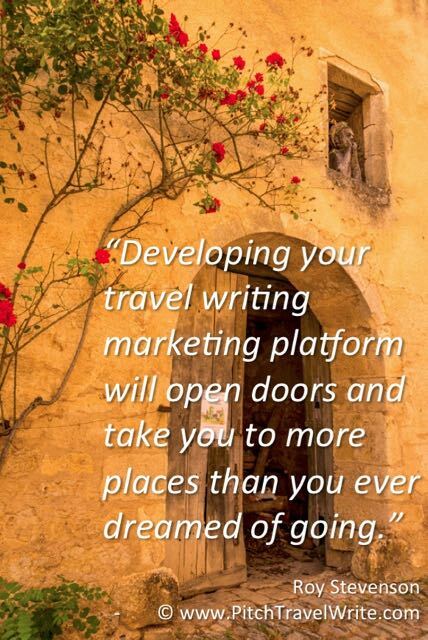 Developing your marketing platform is among the most important travel writing secrets to open doors and take you to more places than you’ve ever dreamed of going.